As is prudent to ensure the safety of the air space around the airport and as there have been at least three drone sightings at Westgate and there is a suspicion they are attempting to drop contraband for inmates to collect, a direction was issued that declares a no-fly zone for drones surrounding the airport, Prospect Police Compound and at Westgate. This was from Minister of National Security Wayne Caines as he spoke in the House of Assembly today [March 22], providing an overview pf recent updates to No Fly Zones, specifically for drones. Minister Caines said, “Honourable Members will recall that Gatwick Airport was recently shut down for several hours following a drone sighting in the surrounding airspace. The ensuing aftermath led to several hours of airport delays as all planes were grounded while authorities worked to uncover the origins and intent of the drone’s presence. “Recently, there have been drone sightings at the L.F. Wade International Airport. Although, often times drone operators intend no harm, flying unmanned aircraft in the airspace surrounding the airport presents a serious hazard to landing and departing aircraft. A crash between the two could result in a catastrophic event. “It is therefore prudent, Mr. Speaker, that measures be taken to ensure the safety and security of the air space surrounding the airport. 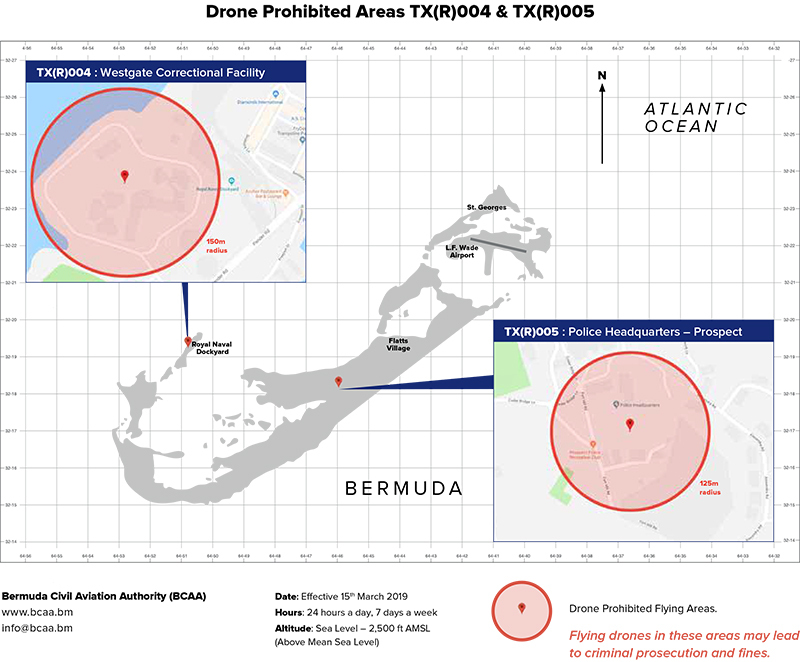 On March 15th, 2019, a Direction was issued by the Director General of the Bermuda Civil Aviation Authority that declares a no-fly zone in the 2 nautical miles radius surrounding the airport for drones that are 400 grams or heavier, microlights, gliders, airships and balloons. These Directions have been issued under Article 68 of the Air Navigation [Overseas Territory] Order. “Similar no fly zones have also been implemented within a 125 metre radius at the Prospect Police Compound and at Westgate Correctional Facility. In recent weeks there have been at least three drone sightings at Westgate. Mr. Speaker, I rise this morning to advise this Honourable House of recent updates to No Fly Zones, specifically for drones. Drones have become increasingly popular, and as technology advances, they are becoming more affordable and readily accessible to hobbyist and the general public. Mr. Speaker, Honourable Members will recall that Gatwick Airport was recently shut down for several hours following a drone sighting in the surrounding airspace. The ensuing aftermath led to several hours of airport delays as all planes were grounded while authorities worked to uncover the origins and intent of the drone’s presence. Recently, Mr. Speaker, there have been drone sightings at the L.F. Wade International Airport. Although, often times drone operators intend no harm, flying unmanned aircraft in the airspace surrounding the airport presents a serious hazard to landing and departing aircraft. A crash between the two could result in a catastrophic event. It is therefore prudent, Mr. Speaker, that measures be taken to ensure the safety and security of the air space surrounding the airport. 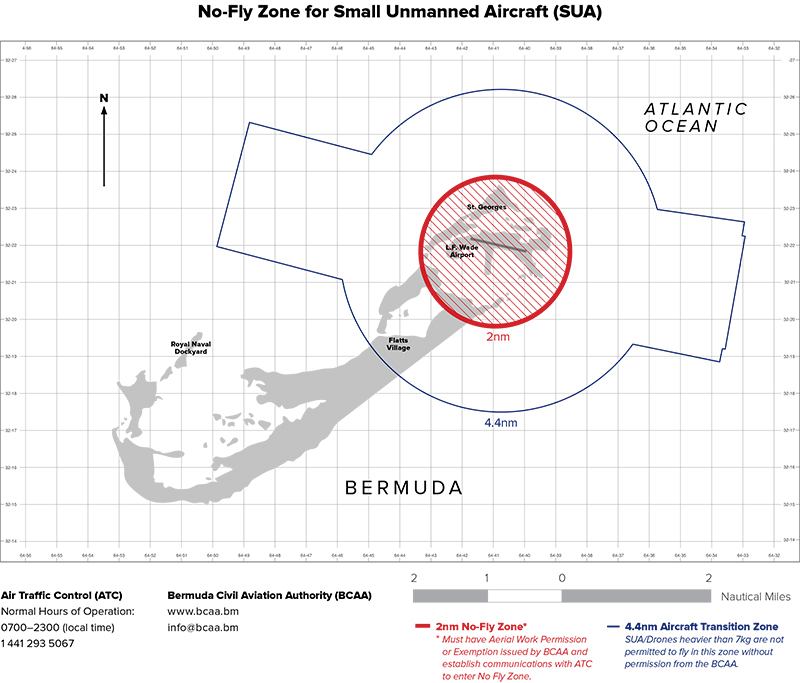 On March 15th, 2019, a Direction was issued by the Director General of the Bermuda Civil Aviation Authority that declares a no-fly zone in the 2 nautical miles radius surrounding the airport for drones that are 400 grams or heavier, microlights, gliders, airships and balloons. These Directions have been issued under Article 68 of the Air Navigation [Overseas Territory] Order. Mr. Speaker, similar no fly zones have also been implemented within a 125 metre radius at the Prospect Police Compound and at Westgate Correctional Facility. In recent weeks there have been at least three drone sightings at Westgate. There is suspicion that these drone operators are attempting to drop contraband inside the correctional facility property for inmates to collect. Members of the public are reminded that any attempt to introduce any form of contraband, whether illicit substances or not, is illegal. Any persons found to be attempting to introduce contraband will be arrested and prosecuted in accordance with the law. Mr. Speaker, I would like to take this time to provide the public with some general guidance on drone usage. Drone operators, whether amateur, hobbyist, or professional, are reminded that they are responsible for the conduct of each flight. Before each flight, the operation should check the drone for damage and ensure that they will not be flying within 50 metres of a person, vehicle, building or structure. Drones should never be operated in congested areas. The drone should be in the sight of the operator at all times and must never fly above 400ft. Following these guidelines will help to avoid collisions. In all cases, permission must be sought to fly drones over property that is not your own. The right of privacy should always be respected. Further information on the safe and legal operation of drones can be found on the website of the Bermuda Civil Aviation Authority, www.bcaa.bm. Mr. Speaker, it is not the Government’s intent to prohibit the use of drones in Bermuda, however safety and security must take priority. I encourage all drone operators to ensure that they are operating their crafts in accordance with published legislation and policy.